I get extremely flattered when someone asks me to make them something specific. My mom’s friend recently commissioned a Christening blanket for her new granddaughter. It’s such an important piece of a family’s history! I felt a little intimidated by the significance this might have, but she calmed me down and set me down a simple path: white and square-ish. That’s IT. 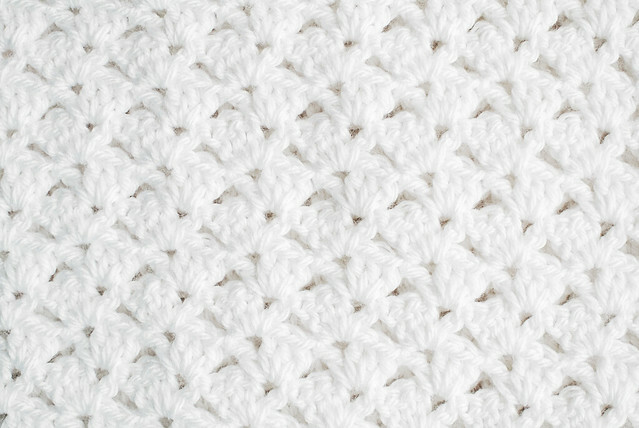 Naturally, I scoured the web for Christening blanket patterns and inspiration, but I ended up just using my favorite stitch pattern. 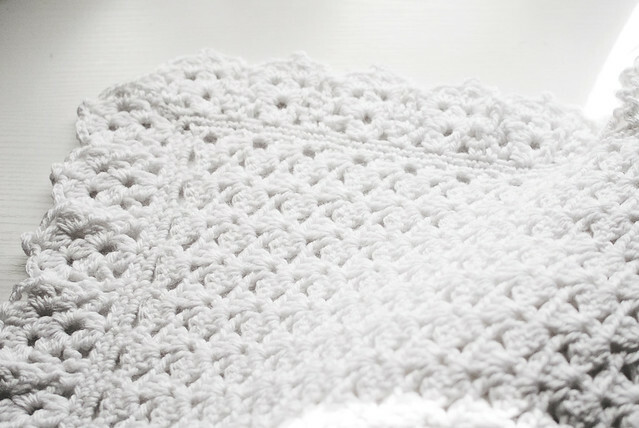 The offset shell stitch has been made into many blankets for babies in my family (check out those posts here), so it felt like a good choice. I used Bernat’s Softee Baby and a 5mm (US 8/H) hook. My beginning chain was 148 and I worked until it was just about a square. I’m not sure how many rows exactly. I made a single crochet border around the whole thing, then searched for a lacy border to add. I found about a bajillion charts of lace edges on Pinterest and ended up here where I found the lovely border I ended up choosing. After figuring out the number of stitches in the pattern, I made another round of single crochet to adjust my stitch count. Luckily I wasn’t off by too much! I think it came out lovely. It’s big and squishy and machine washable. It should last a really long time. Who knows, maybe this grandbaby will still have the blanket when she has grandbabies of her own. Me again! 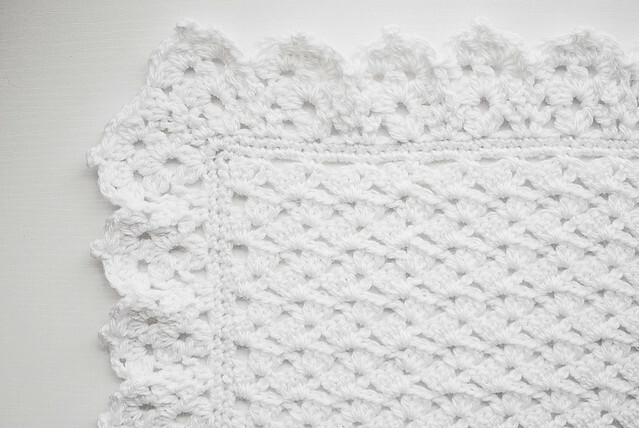 One last question about the christening blanket – can you tell me with starting with 148 stitches, approximately what was the finished size before the border was added? Do you happen to have that in your notes? I was just trying to figure out how many multiples of 4 I wanted to cast on for a smaller baby afghan (rectangle). Thank you! This is beautiful! 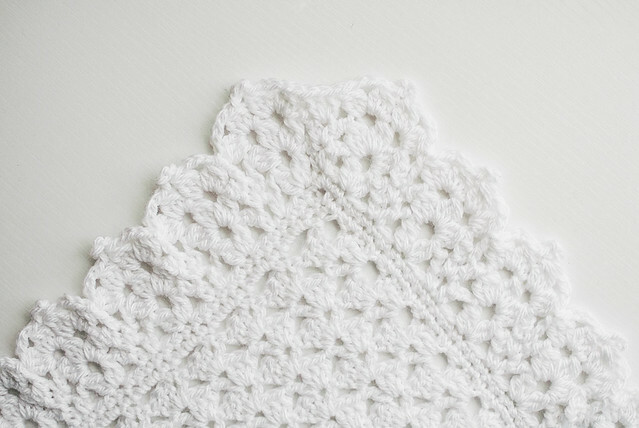 I am planning on crocheting a christening blanket for my grandchild coming in April. Thank you for the inspiration! But where can I find instructions for the border? Please post a link to the border! !